For some time, India has been trying to solve its Twin Balance Sheet problem–over-leveraged companies and bad-loan-encumbered banks — using a decentralised approach, under which banks have been put in charge of the restructuring decisions. But decisive resolutions of the loans, concentrated in the large companies, have eluded successive attempts at reform. The problem has consequently continued to fester: NPAs keep growing, while credit and investment keep falling. Perhaps it is time to consider a different approach – a centralised Public Sector Asset Rehabilitation Agency that could take charge of the largest, most difficult cases, and make politically tough decisions to reduce debt. 4.1 In February 2016, financial markets in India were rocked by bad news from the banking system. One by one, public sector banks revealed their financial results for the December quarter. And the numbers were stunning. Banks reported that non-performing assets had soared, to such an extent that provisioning had overwhelmed operating earnings. As a result, net income had plunged deeply into the red. 4.2 The news set off alarm bells amongst investors, who responded by fleeing public sector bank shares, bringing their prices to such low levels that at one point the medium-sized private sector bank HDFC was valued as much as 24 public sector banks put together (Figure 1). 4.3 What had happened? Normally, non-performing assets (NPAs) soar when there is an economic crisis, triggering widespread bankruptcies. This is precisely what happened in East Asia during 1997-98 and the US and UK in 2008-09. But there was no economic crisis in India; to the contrary, GDP was growing at a world-beating pace. Nor had there been any major calamity in the corporate sector; no large firm had gone bankrupt. were completed in March. But NPAs nonetheless continued to climb, reaching 9 percent of total advances by September — double their year-ago level. Equally striking was the concentration of these bad loans. More than four-fifths of the non-performing assets were in the public sector banks, where the NPA ratio had reached almost 12 percent (Figure 2a). Source: Reserve Bank of India for NPAs; Credit Suisse for debt share. *: Percent of debt owed by companies that have interest coverage ratio less than one, where cash flow is measured by EBIT, earnings before interest and taxes. Based on sample of 3,700 listed nonfinancial companies. Debt share numbers are for end-March for 2013- 2016. H117 refers to the first half of FY17. corporate sectors were under stress. Not just a small amount of stress, but one of the highest degrees of stress in the world. 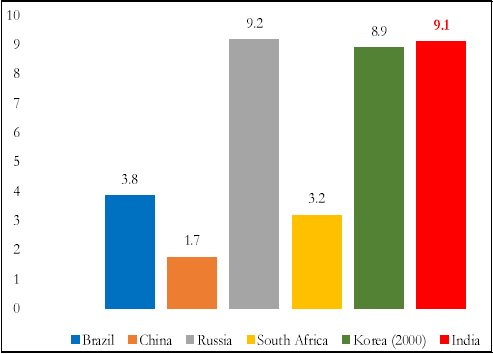 At its current level, India’s NPA ratio is higher than any other major emerging market (with the exception of Russia), higher even than the peak levels seen in Korea during the East Asian crisis (Figure 4). Source: RBI for India. World Development Indicators, World Bank for others. 4.7 How can this possibly be explained? Typically, countries with a twin balance sheet (TBS) problem follow a standard path. Their corporations over-expand during a boom, leaving them with obligations that they can’t repay. So, they default on their debts, leaving bank balance sheets impaired, as well. This combination then proves devastating for growth, since the hobbled corporations are reluctant to invest, while those that remain sound can’t invest much either, since fragile banks are not really in a position to lend to them. 4.8 This model, however, doesn’t seem to fit India’s case. True, India had boomed during the mid-2000s along with the global economy. But it sailed through the GFC largely unscathed, with only a brief interruption in growth before it resumed at a rapid rate. According to conventional wisdom, this happened because Indian companies and banks had avoided the boom-period mistakes made by their counterparts abroad. More precisely, in this view, they were prevented from accumulating too much leverage, because prudential restrictions kept bank credit from expanding excessively during the boom, while capital controls prevented an undue recourse to foreign loans. 4.9 If this narrative is correct, then it is puzzling that India nonetheless wound up with a twin balance sheet problem. Conversely, if the narrative is wrong and India followed the classic path to the TBS problem, then it is unclear why the consequences have seemed so minor. 4.10 One reason for the modest consequences comes readily to hand. In other TBS cases, growth was derailed because high NPA levels had triggered banking crises. But this has not happened in India. In fact, there has not even been a hint of pressure on the banking system. There have been no bank runs, no stress in the interbank market, and no need for any liquidity support, at any point since the TBS problem first emerged in 2010. And all for a very good reason: because the bulk of the problem has been concentrated in the public sector banks, which not only hold their own capital but are ultimately backed by the government, whose resources are more than sufficient to deal with the NPA problem. As a result, creditors have retained complete confidence in the banking system. What went wrong – and when did it go wrong? How has India managed to achieve rapid growth, despite its TBS problem? 4.12 The answers to these questions are complex. But the policy implications can be summarised easily enough. For some years, it seemed possible to regard TBS as a minor problem, which would largely be resolved as economy recovery took hold. But more recently it has become clear that this strategy will not work. Growth will not solve the problems of the stressed firms; to the contrary, the problems of the stressed firms might actually imperil growth. 4.13 To avoid this outcome, a formal agency may be needed to resolve the large bad debt cases – the same solution the East Asian countries employed after they were hit by severe TBS problems in the 1990s. In short, the time may have arrived to create a ‘Public Sector Asset Rehabilitation Agency’ (PARA, Box 1).